How many people would lose their lives if the Republican effort to repeal the Affordable Care Act succeeds? Estimates of this inherently murky statistic vary, but the range is from about 28,000 to nearly 100,000 a year. That’s a shocking toll from an effort that is essentially aimed at gifting the wealthiest Americans with hundreds of billions of dollars in tax cuts by slashing healthcare. So no one should be surprised that Republican and conservative supporters of the House and Senate repeal bills have spent a lot of time claiming that nothing of the sort will happen. The effort moved into high gear this weekend, following Thursday’s unveiling of the Senate GOP’s version of ACA repeal. Arguing that health insurance coverage doesn’t improve health is simply inconsistent with the evidence. Some conservative pundits went further, treating the argument that the cutbacks would cost lives as some sort of left-wing libel. Some employed the ancient debating trick of trying to defuse an opponent’s arguments by ruling them old-hat, or out-of-order. Case in point: Conservative commentator Avik Roy’s defense of the Senate repeal bill via a tweet in which he wrote, “I’m very open to thoughtful critiques of the Senate bill from the left. ‘MILLIONS WILL DIE’ is not it.” Right-wing political scientist Charles Murray took a similar tack, also on Twitter: “Show me the data on lives saved by Obamacare, please,” he wrote. The effects from the Senate and House repeal bills are almost identical. The Congressional Budget Office on Monday found that the Senate bill would lead to the loss of coverage by 22 million Americans by 2026. That’s a hair better than the House Republican repeal bill, passed by that chamber in May. The Congressional Budget Office estimated that the House bill would cost 23 million Americans their coverage by 2026. But estimates of how many Americans might die if either chamber’s repeal bill becomes law are abundant. The most recent and complete overview of the data on the health effects of insurance coverage was published in the New England Journal of Medicine just last week by Benjamin Sommers, Atul Gawande and Katherine Baicker of the Harvard School of Public Health. “Arguing that health insurance coverage doesn’t improve health is simply inconsistent with the evidence,” they wrote. The authors reached their conclusion by examining studies of mortality rates following the expansion of coverage, generally Medicaid coverage, in various states. Of these studies, the most conservative figure came from a Sommers-led study of the 2006 Massachusetts healthcare reform known as “Romneycare,” a precursor of the ACA. The study found that one death a year would be prevented for every 830 adults gaining coverage. That implies that the loss of insurance would lead to about 26,500 deaths in 2026, the year the CBO said the number of Americans tossed out of the insurance pool would reach 22 million under the Senate bill, and 27,700 deaths under the House bill. The Center for American Progress compiled the CBO’s estimates of annual coverage losses from the House bill, applied Sommers’ rate, and showed that over the next decade, the repeal would lead to about 217,000 more deaths than would occur under current law — that is, the Affordable Care Act, which doesn’t eliminate uninsurance entirely but does reduce it substantially. Matt Breunig depicts this toll in a handy chart, a version of which is reproduced below. He adds a line designating a single-payer plan, which by bringing coverage to all Americans would reduce the number of deaths from uninsurance to zero. Sommers revisited the topic this year in a paper scheduled for publication in the American Journal of Health Economics, based on Medicaid expansions in New York, Arizona and Maine dating back to 2001. There he estimates that one life is saved for every 239 to 316 adults gaining coverage, a rate that implies that the loss of coverage by 22 million would cost as many as 92,000 lives a year by 2026 under the Senate bill, and 96,200 under the House bill. These estimates would seem purely speculative if they weren’t backed up by data and findings pointing to why health coverage leads to better health and reduces mortality. Those are abundant too. The data show that insurance helps people in several ways. It improves financial security, the NEJM survey observes. It improves access to care, especially primary care, prescription medicines, preventive care and medical supervision of long-term conditions. It ensures that treatments won’t be interrupted for financial or other reasons. That’s a key for cancer patients, most of whom require “a period of ongoing care,” the NEJM authors note. About 8 million Americans under 70 are “currently living with cancer,” they say. Well, no. The Oregon study he cites showed nothing of the kind. Since Roy refers to the Oregon study repeatedly, it’s proper to examine what it did show. The study found that going on Medicaid reduced the financial strain on the enrollees and improved their assessments of their own health, which researchers consider an important health indicator. The study found measurable reduction in depression. It found that the enrollees’ access to doctors improved, which debunks the persistent claim that Medicaid members can’t get healthcare because reimbursements are too low. Roy and other Medicaid critics flog the Oregon study’s finding of no measurable effect on high blood pressure, cholesterol or blood sugar, which are markers of coronary risk and diabetes. This appears to be the source of their claim that Medicaid is no better than no insurance at all. But that’s not at all what the researchers concluded. The researchers noted, first of all, that their study may not have been powerful enough to determine such changes, in part because of “the relatively small numbers of patients with these conditions” in the study. Still, the results they did find in blood sugar readings, while too small to be statistically significant, were consistent with improved medication of diabetes. Altogether, “We found that insurance led to increased access to and utilization of health care, substantial improvements in mental health, and reductions in financial strain,” the researchers wrote. Does that sound like Medicaid is “a trap … no better than being uninsured”? The authors of the study Roy cites certainly didn’t think so. The research cited by Sommers, Gawande and Baicker doesn’t even address the effect of the higher premiums and soaring deductibles that will be caused by the House and Senate repeal bills. But these are significant; the repeal bills cut way back on subsidies for premiums and deductibles for most people in the individual insurance market, especially older enrollees. 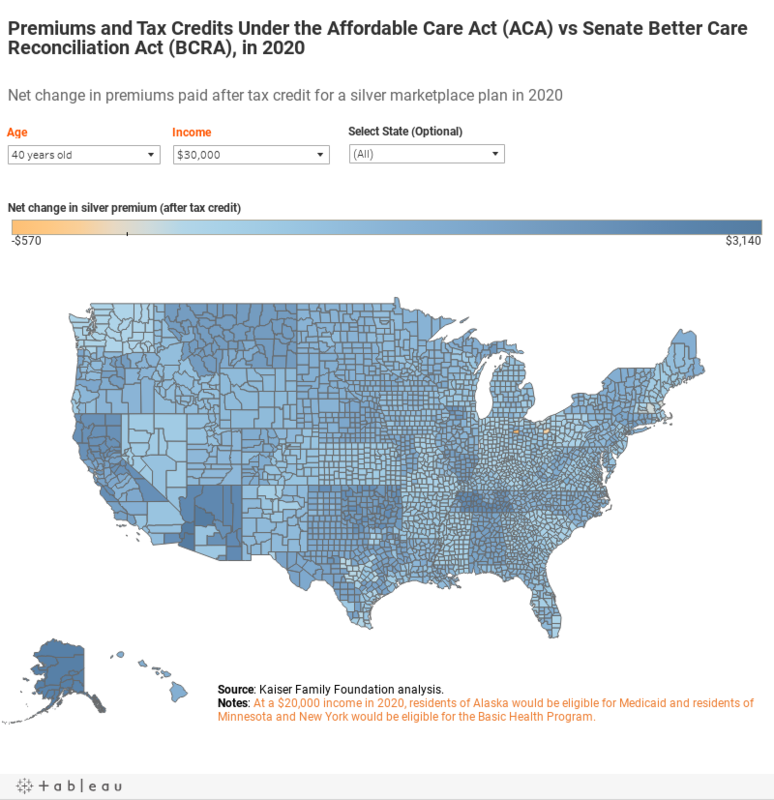 For a picture of how the Senate repeal bill will affect premiums and subsidies for people at various ages, income and geographic locations, see the interactive map below, provided by the Kaiser Family Foundation. As the foundation’s Larry Levitt observes, people with incomes up to 150% of the poverty level (that would be about $18,100 for an individual and $36,900 for a family of four) would pay an average deductible of $255 a month. Under the Senate bill, it would be more than $6,000. Inevitably cost increases like these will drive millions of Americans out of the health insurance market. They’ll find it harder to afford medical care and will face bankruptcy if confronted with a major health crisis or a chronic disease. They’ll skimp on preventive measures that will avert more serious diseases down the road. That will increase the cost of healthcare across the entire nation, possibly for generations. And yes, people will die. Republican efforts to deny this shouldn’t be believed, because history and the numbers scream otherwise. 1:36 p.m.: This post has been updated with the CBO analysis of the Senate GOP repeal bill.